New software update enables MPC X, MPC Live and MPC Software 2 users to take advantage of three great new built-in synthesizers–TubeSynth, Bassline and Electric–and other upgrades. Cumberland, RI USA (November 15, 2018) — Akai Professional today announced the release of MPC Software 2.3. 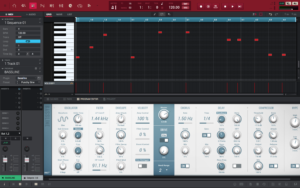 This major software and firmware update introduces a number of user requested features and functionality enhancements, notably the addition of three powerful, versatile, and expressive built-in synthesizers by AIR Music Technology (TubeSynth, Bassline and Electric) to the MPC standalone experience. This is a landmark feature addition which elevates the MPC from a sampler to a true musical powerhouse. Also very significant is the addition of Autosampler and Arpeggiator. As a result, this update is highly recommended for all current MPC X, MPC Live and MPC Software 2 owners. The TubeSynth emulates the sound of classic vintage analog poly-synths packaged with five integrated AIR effects. 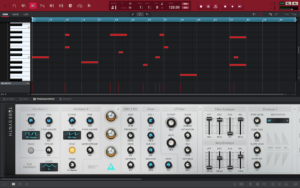 The instrument is created by AIR and is based on the same advanced analog modelling technology found in their highly acclaimed desktop plugin synth Vacuum Pro. The layout has been carefully designed for easy tweak-ability via the MPC Q-Links. The TubeSynth comes packaged with a comprehensive factory library of cutting-edge presets including sumptuous pads, hard hitting plucks, thunderous basses and screaming lead sounds. • Flexible 3 Oscillator architecture features noise, saw, square, pulse and triangle waveforms. • Two different unison engines offer extended possibilities for thickening the timbre of any patch. • Users can customize the harmonic content of Oscillator 2 using the voice level EQ and Drive parameters. • Lowpass Filter with continuously variable slope with pre and post distortion. • Polyphonic Glide/Portamento for polyphonic pitch slides between chords. • Envelopes included for Filter, Amp with a third specialist ramp envelope that can be assigned to different modulation destinations. • Two LFO’s have Sine, Square, Saw Up, Saw Down, Pump, Sample and Hold and Drift waveforms. • Explore a wide range of timbral possibilities with the Oscillator’s Ring Modulation parameter. • AIR Chorus, Delay, Reverb, Compressor and Hype EQ. • Almost 300 patches provide a wide selection of Synth, Lead, Pluck, Pad, Bass, Organ, FX presets. • Sub and fifth oscillators for thicker layered timbres. • Low-pass and high-pass filters. The AIR Electric emulates the sound of classic electric pianos. • Dedicated Pickup, Envelope, Bell and Noise parameter sections provide a huge amount of flexibility to configure the timbre of the electric piano sound. • Five AIR effects Tremolo, Tube distortion, Chorus, Delay and Spring Reverb. • Autosampler – Capture and convert any plugin preset or external instrument preset into a key group sampler patch. This is great for sampling patches from synths and drum machines. • Crossfade Looping – Realtime crossfade looping has now been added to sample playback. • Arpeggiator – A real time arpeggiator and phrase player. This update is free for existing MPC Software 2 owners (2.0 – 2.2). MPC 2.3 is available as a new purchase for $199.99 for non-MPC product owners or as an upgrade from MPC Software 1 or MPC Essentials for $99.99. For complete details on new features found in 2.3, visit: MPC 2.3 Release Notes. Berlin, Germany | January 24, 2018We’re pleased to announce, the beta testing of Bitwig Studio 2.3 has just started. 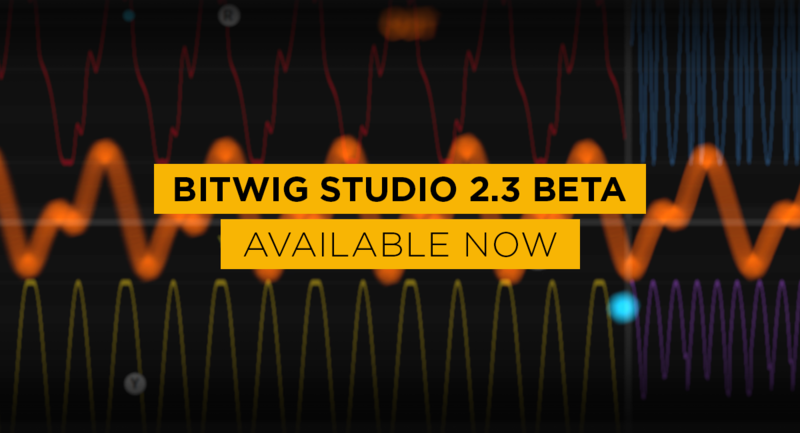 The Bitwig Studio 2.3 Beta installer is available from our download page. Once installed you can download 50 Phase-4 presets from the Package Manager to get started. Do not use the beta to work on important projects! Bitwig is an international music software company based in Berlin with 13 employees. The company was founded in 2009 by four music enthusiasts with extensive experience in the music technology industry and a strong vision about new cutting-edge methods of music production, performance and collaboration. Bitwig Studio 2 won awards for Best Software of NAMM show 2017 by MusicRadar and Sonic State and was awarded ‘DAW of the Year 2017’ by Computer Music Magazine.